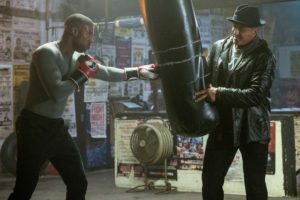 Via MGM and Warner Bros come two new images from the forthcoming film Creed II starring Michael B. Jordan and Sylvester Stallone. I can’t wait to see Creed 3 with a Rocky that gets and remains in great shape because he likes the training aspect of the fight game, training and occasionally sparing with the fighters he trains, manages and recruits the people and fighters he wants in his gym, while he preps championship fighters. Regardless of what the next plot may be I’m looking forward to following the on going story of Rocky and his family. It’s usually a good story and good entertainment. Silvester: thank you for these huge moments. Creed 2 I wait for you. Rubén, Spain. CAN'T WAIT!!! GO ROCKY!! GO ADONIS!! We have really enjoyed all of the Sylvester Stallone movies that we've seen - we especially identify with the 'Rocky/Creed' series! Thank you.